Salaries for entry-level newspaper reporters last year increased about $1,000, or four percent, according to the most recent journalism job market study by University of Georgia's James M. Cox Jr. Center for International Mass Communication Training and Research. The average salary for rookie reporters at daily newspapers was $28,000. However, broadcast media outlets decreased their starting salaries. TV journalists made $440 less and radio journalists suffered a $2,000 -- or seven percent -- pay cut. The average salaries were $29,300 for television and $25,000 for radio, respectively. 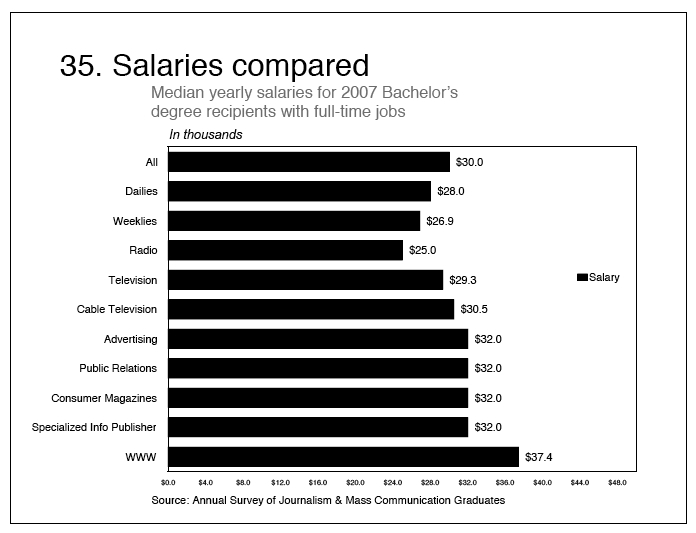 The annual survey compared the salary figures of 2007 college graduates with 2006 college graduates. 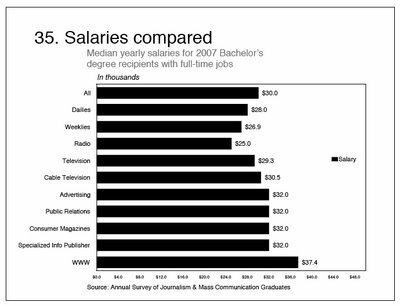 Overall, the median media salary for 2007 bachelor's degree recipients was $30,000 -- exactly the same as the median salary for 2006 grads. Those figures include entry-level jobs in advertising, public relations and other media-related fields. See chart below for more details.